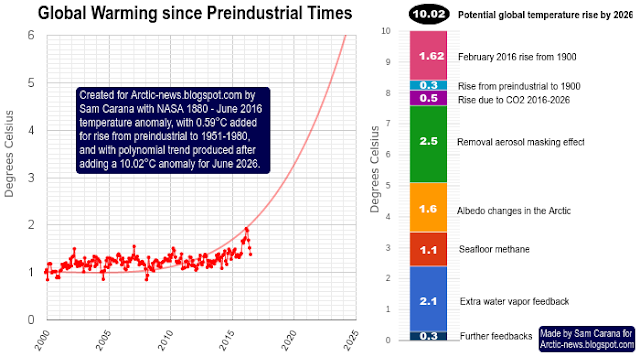 A temperature rise (from preindustrial levels) of more than 10°C (18°F) could eventuate by the year 2026, as illustrated by the image below and as discussed in an earlier post. The high temperature anomaly that occurred in February 2016 was partly caused by El Niño. Nonetheless, there is a threat that the February 2016 anomaly was not a peak, but instead was part of a trend that points at what is yet to come. As the image below shows, 93.4% of global warming goes into oceans. 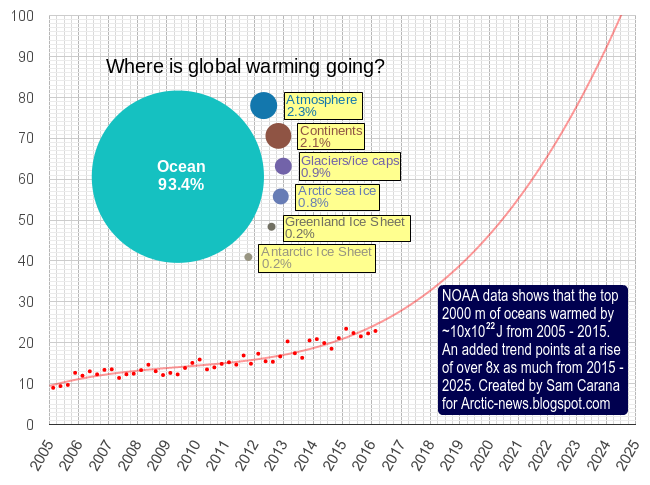 Accordingly, ocean heat has been rising rapidly and, as the image below shows, a trend points at a huge rise over the coming decade. Ocean temperature rise affects the climate in multiple ways. A recent study confirmed earlier fears that future increases in ocean temperature will result in reduced storage of carbon dioxide by oceans. Importantly, ocean temperature rises will also cause Arctic sea ice to shrink, resulting in albedo changes that will make that less sunlight gets reflected back into space, and more sunlight instead gets absorbed by the Arctic Ocean. Arctic sea ice is losing thickness rapidly. 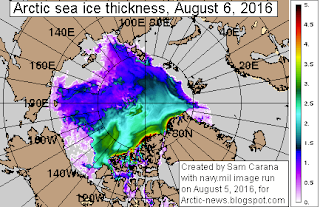 The image on the right shows that the thicker sea ice is now almost gone (image shows sea ice on August 6, 2016, nowcast). The image below gives a comparison of the years 2012, 2013, 2014 and 2015 for August 6. The situation looks even more threatening when looking at the Naval Research Laboratory image below, produc ed with a new model and run on August 3, 2016, valid for August 4, 2016. 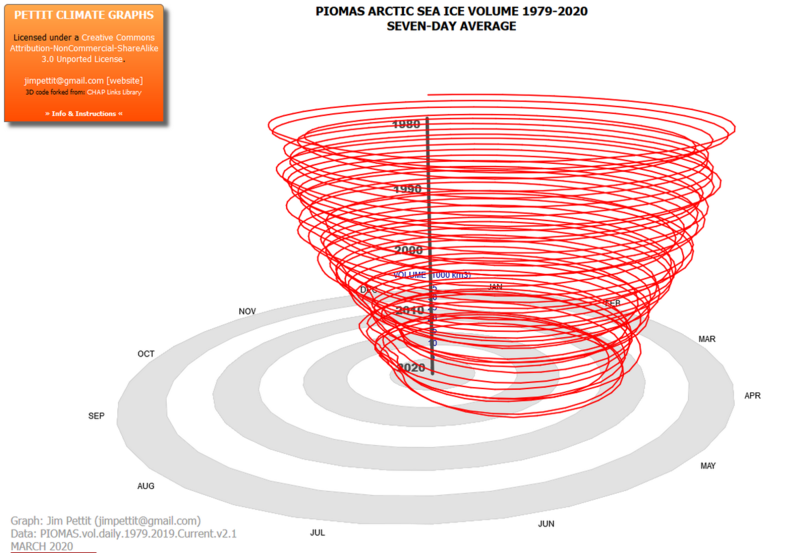 The image below, by Jim Pettit, shows Arctic sea ice volume. The extra heat entering the oceans translates in a huge temperature rise at the sea surface, as illustrated by the image below, from an earlier post and using sea surface temperature anomalies on the Northern Hemisphere up to November 2015. The Arctic Ocean is feeling the heat carried in by the Gulf Stream. 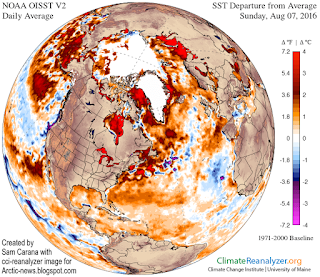 The image on the right shows sea surface temperature anomalies from 1971-2000. Note that the anomalies are reaching the top of the scale, so in some areas they will be above that top end (i.e. 4°C or 7.2°F) of the scale. 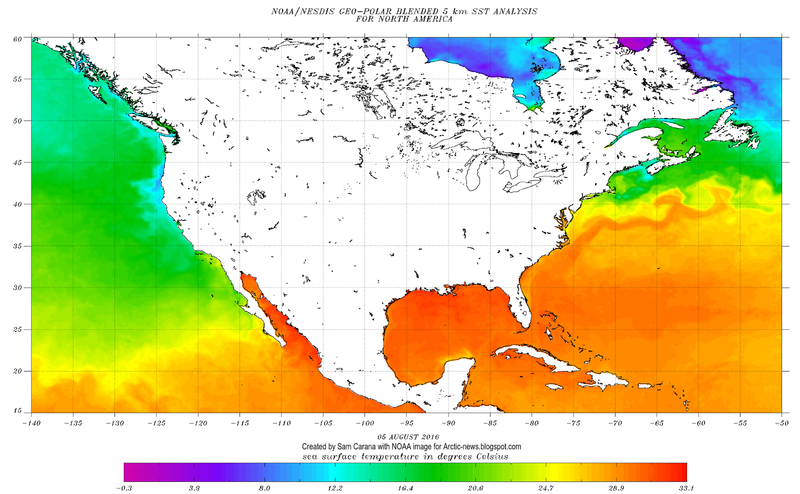 Sea surface temperatures off the coast of North America are very high, with sea surface temperatures as high as 33.1°C, as the image below shows. Much of the heat accumulating in the Gulf will be carried by the Gulf Stream to the Arctic Ocean over the coming months. 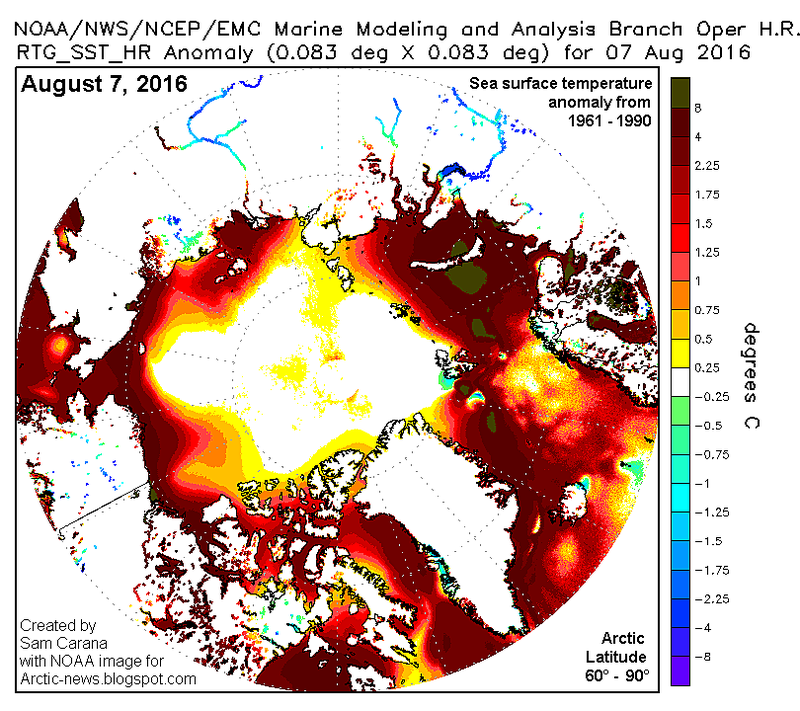 The image on the right shows Arctic sea surface temperature anomalies on August 7, 2016, as compared to 1961-1990. 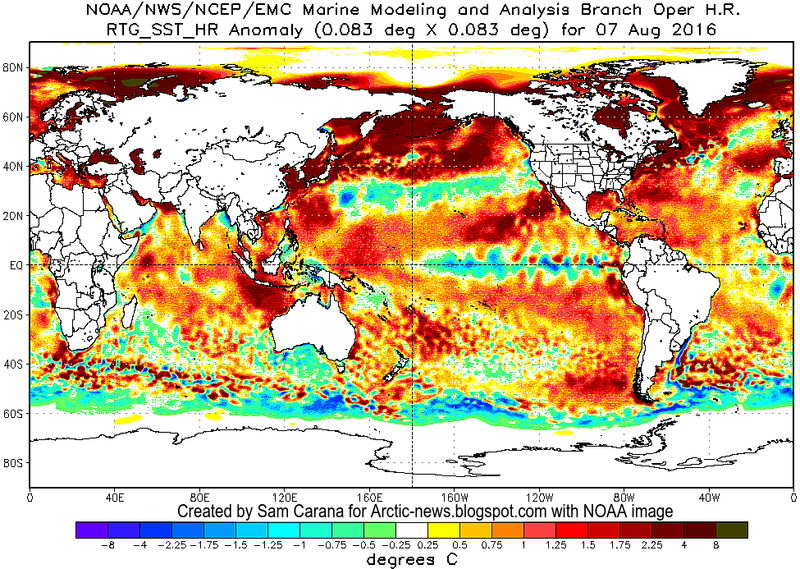 Note the black areas where sea surface temperature anomalies are above 8°C. Sea surface temperatures in the Arctic Ocean will remain around freezing point, where and for as long as there still is sea ice present. Once the sea ice is gone, though, sea surface temperature in that area will rise rapidly. The image below shows how profound sea surface temperature anomalies are at higher latitudes of the Northern Hemisphere. While sea surface temperatures can be huge locally, even warmer water may be carried underneath the sea surface from the Atlantic Ocean into the Arctic Ocean, due to the cold freshwater lid on the North Atlantic, as illustrated by the image below, from an earlier post. Sea surface temperature was as high as 18.1°C or 64.6°F close to Svalbard (green circle) on August 6, 2016, 13.1°C or 23.6°F warmer than in 1981-2011, which gives an idea how high the temperature anomaly of the ocean may be just underneath the sea surface. 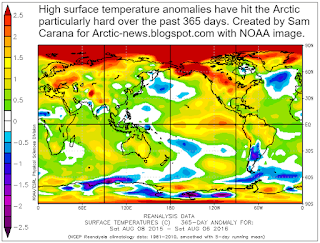 As the image on the right shows, high surface temperature anomalies have hit the Arctic particularly hard over the past 365 days. Apart from melting the sea ice from above, high temperatures over land will also warm up the water of rivers that end in the Arctic Ocean. Warm water from rivers will thus contribute (along with wamer water brought into the Arctic Ocean from the Atlantic and Pacific Oceans) to melting of the Arctic sea ice from below. There's a danger that, as the temperature of the Arctic Ocean keeps rising, huge amounts of methane will enter the atmosphere due to destabilization of hydrates at its seafloor. • A Global Temperature Rise Of More than Ten Degrees Celsius By 2026? • World Ocean Heat Content and Thermosteric Sea Level change (0-2000 m), 1955-2010, by Levitus et al. • Attenuation of sinking particulate organic carbon flux through the mesopelagic ocean, by Marsay et al. This is all very worrying. 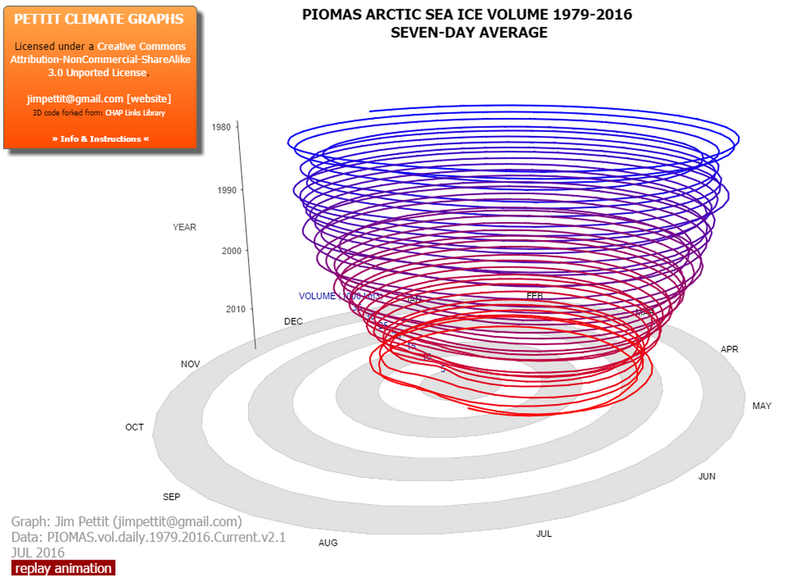 Time appears to have just about run out for Arctic ice and this must surely impact the climate globally. It seems this will become very apparent over the next few years. Hopefully this will shake governments out of their inertia and make them do something to limit emissions and start actively removing CO2 from the atmosphere. 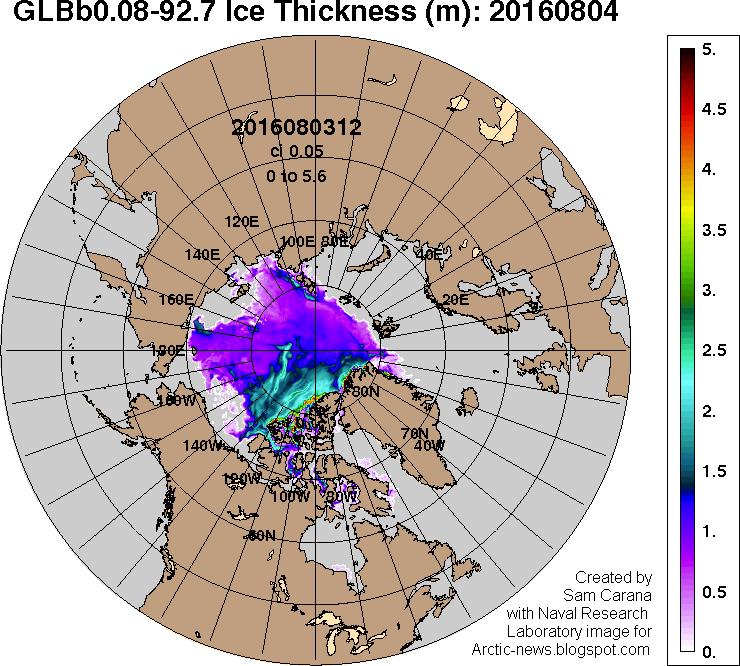 If the ice goes, the temperature of the Arctic sea will continue to increase. This likely will have huge affects on jet stream and weather. The shaking may come sooner.